The airmen he commanded had called him, affectionately, "the Black Prince". Until his peaceful death, aged 85, at home in Tweed Heads, Denis ("Denny") Sharp had been one of the last remaining heroes of the World War II Battle of Britain. This was the introduction on the Obituary for Denis in the Sydney Morning Herald, entitled One of Churchill's heroic few February 6, 2004 - Denis (Denny) Sharp, WWII hero, yachtsman, 1918-2004 by Gary Scully. It is reprinted here exactly, as the article may not remain online in the future. He was awarded the Distinguished Flying Cross for his wartime exploits - after fighting the German Luftwaffe in the skies over Britain, he saw action above France, Germany, Singapore, India and in a gruelling ground campaign with General Orde Wingate's "Chindits" in Burma. Sharp's aircraft was the legendary Hawker Hurricane. Defying the statistics on the average life of the fighter pilot, he survived air combat for six years and a crash in Indonesia after he had flown the last Hurricane out of Singapore before its surrender to the Japanese. His remarkable wartime career has been referred to in books by more than a dozen authors. A native of New Zealand, Sharp brought his family to Australia after the war. He became known to many Sydneysiders as a champion yachtsman, and a member of the Royal Prince Alfred Yacht Club at Newport. His wife, Beverley, also became prominent with her own television segment about craft and needlework, So Cleverly with Beverley, which ran for four years (1977-81) on Channel Ten's Good Morning Australia. They were to make many new friends on the Tweed and the Gold Coast after retirement. Denis John Thomas Sharp was born in Dunedin, New Zealand, the son of hotelier John Sharp and his wife, Margaret. His boyhood hobbies included hunting and fishing - while still at Otago High School, at the age of 17 he was awarded the Kings Empire Medal for shooting. His first job was with the government printing office, but the memory of a biplane on a barnstorming tour touching down in a tricky landing near his home in 1934 had left him with a yearning desire to be an airman. His chance came in 1939 when the New Zealand government was offering flying training commissions in the RNZAF, to recruit pilots to ferry aircraft from Britain to New Zealand. He arrived in England in June, 1939 for his flying training, and when war broke out three months later, he transferred to the RAF, stationed first at Kenley near the RAF fighter command at Biggin Hill. Later he was incorporated into 258 Squadron, comprised mainly of New Zealanders, with the silver fern as its emblem. Squadron 258 was in the thick of the action when the Battle of Britain began in the skies over southern England in July 1940, the Hurricanes and Spitfires of the RAF heavily outnumbered by the might of the German Luftwaffe. Their legendary success in denying Germany air supremacy ended plans for an invasion of Britain and became a turning point in the war. Sharp's leadership and flying ability had earned him rapid promotion and during the Battle of Britain he was a flight commander. One of his wartime mates was Douglas "Tin Legs" Bader, another was Bernard Fergusson, a column leader in the "Chindits", later to be knighted and Governor-General of New Zealand. Because of his dashing, dark good looks (often compared to Errol Flynn or Ronald Coleman) his men dubbed him "the Black Prince" - a sobriquet which was to stick to him throughout the war and at many reunions. In later air combat, Sharp rose to the rank of squadron leader. After fighting in the skies over France and Germany, he realised a change was imminent when his unit was trained in short take-offs and landings for aircraft carriers. However their intended carrier, the Ark Royal, was sunk and they were taken on by the Indomitable, to fly from the carrier to Singapore where aircraft were desperately needed against the rapidly advancing Japanese. 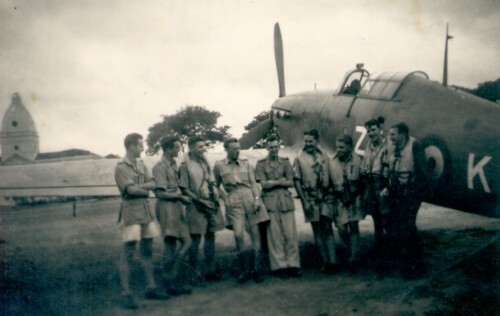 Flying the last Hurricane out of the beleaguered city, Sharp ran out of fuel and crashed at Singkep in Indonesia, wrecking his plane but escaping with minor injuries. As the Japanese tightened their hold on Indonesia, and after a series of hair-raising exploits, he escaped by fishing boat to Colombo. It was there that he volunteered for an unspecified "special mission", believing it would get him back in the air again. Instead, he found himself trekking for three months behind Japanese lines in Burma as air-controller for Wingate's guerilla force, the Chindits, directing the air drops that supplied them. It was a risky, dangerous mission and only about one-third of the Chindits returned. However, they had shown that it was possible to infiltrate and operate in difficult jungle terrain deep in enemy-held territory. Sharp was later to command two air squadrons in India. Towards the end of the war, having renewed his commission with the RNZAF, he returned to New Zealand in early 1945 to convert to Corsair fighters for the Pacific air war. It was there that he renewed his friendship with Beverley Bryant, whom he had last seen six years before as a 15-year old at his farewell before leaving for England. There was a whirlwind courtship and the couple eloped while Sharp was awaiting his re-posting to Pacific air combat. He was still in New Zealand when Japan surrendered. 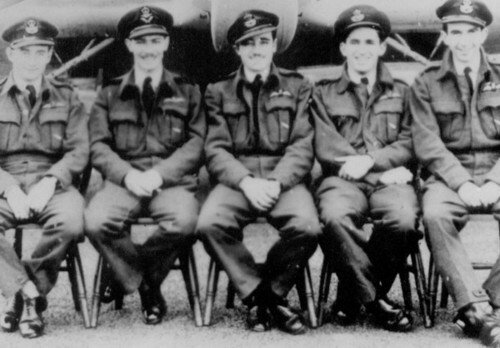 In the immediate postwar years he rejoined the RAF, training pilots on Vampire, Meteor and Lightning jet aircraft. 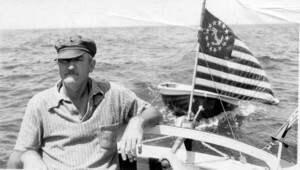 After finally resigning his commission, he brought his family to Australia in 1959. As Beverley puts it: "We pored through an atlas in London looking for the best place to bring up our four boys, and we decided Australia was it." Sharp bought The Henley South Hotel in South Australia and spent four years there until he and Beverley, caravanning to Cairns, were entranced by Sydney's Pittwater. He moved the family to Newport, in a house next door to the Royal Prince Alfred Yacht Club, and set up business locally as a glass merchant. He was to spend the next 30 years as a keen and popular member of the yacht club, winning many championships in several different yachts, from the Diamond class to Compass 29 and Catalina 30s. Beverley says his crewmen nicknamed him "Araldite" because they couldn't pry him loose for a turn at the tiller. 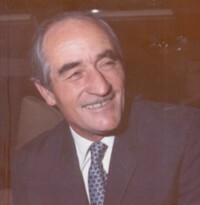 It was the warmer weather that enticed him and Beverley to Tweed Heads in 1993, and Sharp was active in the Currumbin-Palm Beach RSL sub-branch and club across the Queensland border. Many of its members joined family and friends in a funeral service at Tweed Heads to hear a moving eulogy by Beverley, his wife of 60 years. She recalled Winston Churchill's memorable phrase about the Battle of Britain: "Never in the field of human conflict has so much been owed by so many to so few." "Denny," she said, "was one of those few." 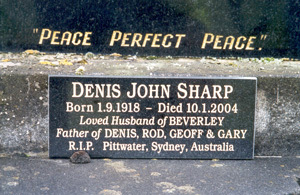 Denis John Sharp is survived by Beverley and their four sons, Denis, Rodney, Geoffrey and Gary. Friends and family are planning a further memorial service for Sharp at his beloved Royal Prince Alfred Yacht Club on February 8. His sons and grandchildren will join former crewmen on board a yacht, to scatter his ashes in Pittwater. Sydney Morning Herald Story ends. This item was found on a private website about Don Geffene, a WWII Fighter Pilot, mentioning Denis. 258 Sqn were equipped with Hurricane ll C's equipped with two 44 gallon long range tanks (which were bolted on and could not be dropped in flight) and armed with four 20 mm cannons. They held 140 rounds each with a 400 rounds per minute rate of fire (when they worked). Our mission was to be tank busting. We had to qualify for carrier landings by practicing using a carrier deck painted on our airdrome. Those who could not or were short on experience were left behind or embarked by separate ships with ground crews and spare parts. They were to arrive via South Africa and Suez canal. We left the UK November 3, 1941 aboard the H.M.S. Athena, with our aircraft on board with wings removed for storage. At Gibralter half of the group loaded on the Aircraft carrier HMS Ark Royal, and a much smaller carrier the HMS Argus. This group flew off to Malta. On the way back a German submarine torpedoed and sunk the Ark Royal. Since this left us with out a means to reach Malta, we were temporarily based at the airdrome in Gibraltar. Our mission there (due to our long range capability), was to patrol the coast looking for subs and flying all the way up to Cadiz, Spain, looking for the Focke-Wolfe Condors that we knew were operating there (contrary to Spain's neutrality) against Atlantic shipping. It was on one of these patrols that Don was flying as my #2. On the way back Don reported engine failure I followed him down as he forced landed on the beach near Cape Spartel, which is on the north west tip of Africa in Spanish Morocco. He did a wheels up forced landing on the beach just south of the cape. (I was in radio contact with him all the way) he reported down safe and I flew down and waved and he waved back while standing out on the wing. I told him to destroy the aircraft but he said no matches so I told him to stand clear as men were approaching from the land side. He did and I opened fire on his downed aircraft, causing major damage. By this time Flt/lt. Denny Sharp who was flying near Gibraltar, appeared and finished the destruction, setting it on fire. It should be noted that this incident caused some problems with the Franco government. Don was interned there, in Tangier. I heard later that he charmed the Governor General's daughter into helping him escape. Read the story of the Burma Campaign and snippets from the book Beyond the Chindwin where Denis is mentioned. This letter from Denis to his mother Margaret was written in Ceylon in March 1942. Download and view letter (20KB pdf). 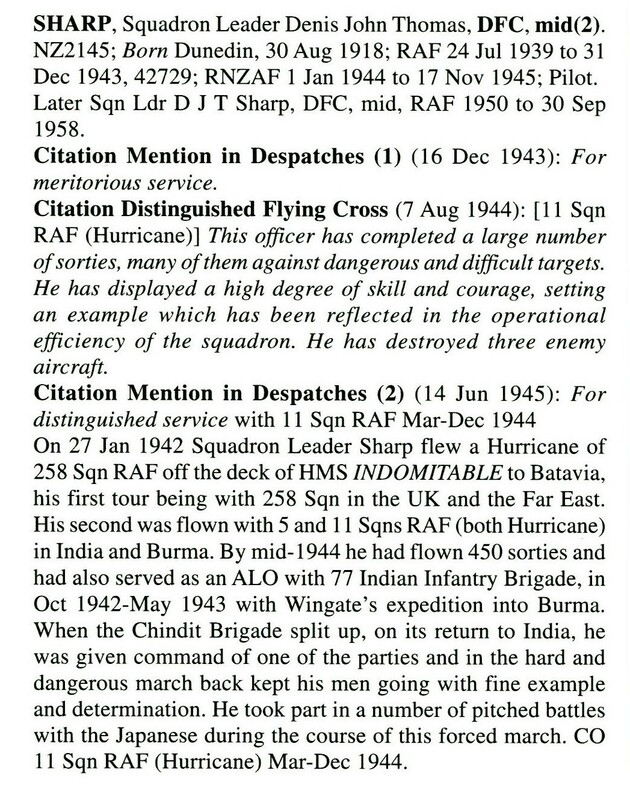 Also view an extract from the book Hurricane Aces 1941-1945 where Flt Lt Denny Sharp is mentioned as leading a scramble against a Japanese bomber formation in Singapore. The award of the Distinguished Flying Cross to Acting Squadron Leader Denis John Thomas Sharp, for displaying a high degree of skill and courage and setting an example which has been reflected in the operational efficiency of his squadron, was announced tonight. Squadron Leader Sharp has destroyed three aircraft. He is a son of Mr JB Sharp of Dunedin, where he was employed before enlisting in the Air Force. Citation: Mention in Despatches (1), 16 December 1943. Citation: Mention in Despatches (2), 14 Jun 1945, with 11 Sqn RAF, March and December 1944. View the full details in this extract from "By Such Deeds" by C.M. Hanson, a Who's Who of the NZRAF. 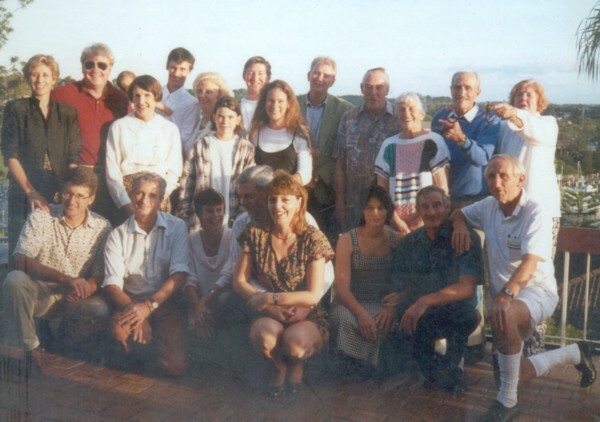 Pictured: Denis and Beverley Sharp with their family - 50th wedding anniversary, 1995. These two newspaper items were found amongst records held by Eileen Baker. Otago, June 1939: Lands and Survey: Hearty congratulations to Denis Sharp on his appointment to the Royal Air Force. He leaves for Uxbridge, England, on the 15th June and carries with him our best wishes for his success in his hazardous undertaking. Bon voyage, Denis. Advice has been received of the promotion of Flying-Officer Denis J T Sharp, RAF, to the rank of flight-lieutenant. Flight-lieutenant Sharp is a son of Mr J B Sharp, late of St Clair, and a former pupil of the Otago Boys High School. Denis and Beverley have four sons, a number of grandchildren and great-grandchildren, all living or based in Australia. A plaque for Denis was placed at the base of his parent's headstone on the family plot in Andersons Bay, Dunedin, and a short memorial service was held by assembled family members in 2005. Beverley passed away at Tweed Heads on 4th May 2018 aged 94 years. She was privately cremated.